Breast cancer survivors can follow the general nutritional guidelines of eating vegetables daily and may consider increasing intake of cruciferous vegetables, such as greens, cabbage, cauliflower and broccoli, as part of a healthy diet," said Nechuta. Nechuta, Xiao Ou Shu, M.D., Ph.D., and colleagues investigated the role of cruciferous vegetables in breast cancer survival among women in the Shanghai Breast Cancer Survival Study, a prospective study of 4,886 Chinese breast cancer survivors who were diagnosed with stage 1 to stage 4 breast cancer from 2002 to 2006. Shu, Ingram Professor of Cancer Research, is the principal investigator of the Shanghai Breast Cancer Survival Study. Survival rates were influenced by vegetable consumption in a dose-response pattern. As women ate more of these vegetables, their risk of death or cancer recurrence decreased. Women who were in the highest quartiles of intake of vegetables per day had a 62 percent reduced risk of total mortality, 62 percent reduced risk of breast cancer mortality, and 35 percent reduced risk of breast cancer recurrence, compared to women with the lowest quartile of intake." "Commonly consumed cruciferous vegetables in China include turnips, Chinese cabbage/bok choy and greens, while broccoli and Brussels sprouts are the more commonly consumed cruciferous vegetables in the United States and other Western countries," she said. "The amount of intake among Chinese women is also much higher than that of U.S. women." 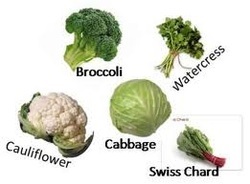 She said there is a need for future studies that measure the bioactive compounds in these vegetables and the host factors that may influence the effects of these compounds to improve the understanding of the association between cruciferous vegetable consumption and breast cancer outcomes.